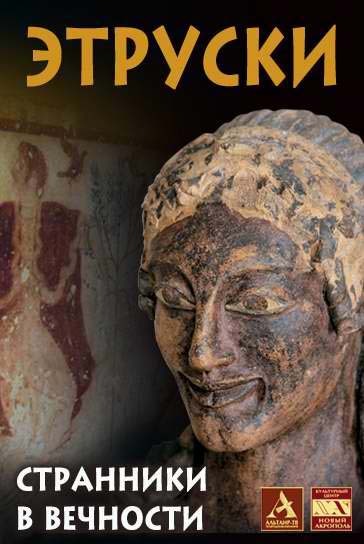 The Etruscan soul, naïve and simple, smiles at us with the lips of a mysterious deity. He is over 2.5 years old. He used to stand on the temple roof. 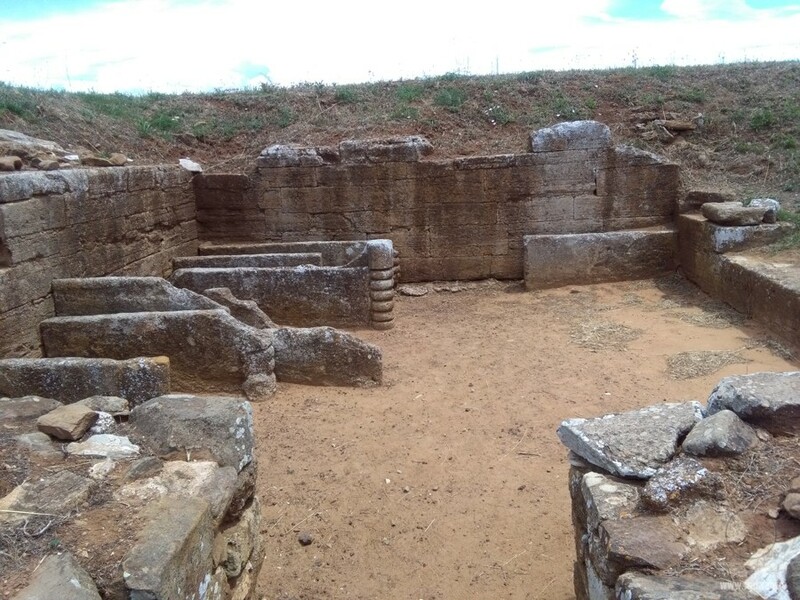 The terracotta sculpture of Apollo (don’t confuse him with Apollo of Greece; the sculpture was named so for mere convenience) was found where, as researchers assume, the ancient Etruscan city of Veio was situated. They say, when in 1916 archaeologist Julio Gilioli cleaned Apollo’s head and shoulders of soil, his feelings were so overwhelming that he bowed and kissed the statue. 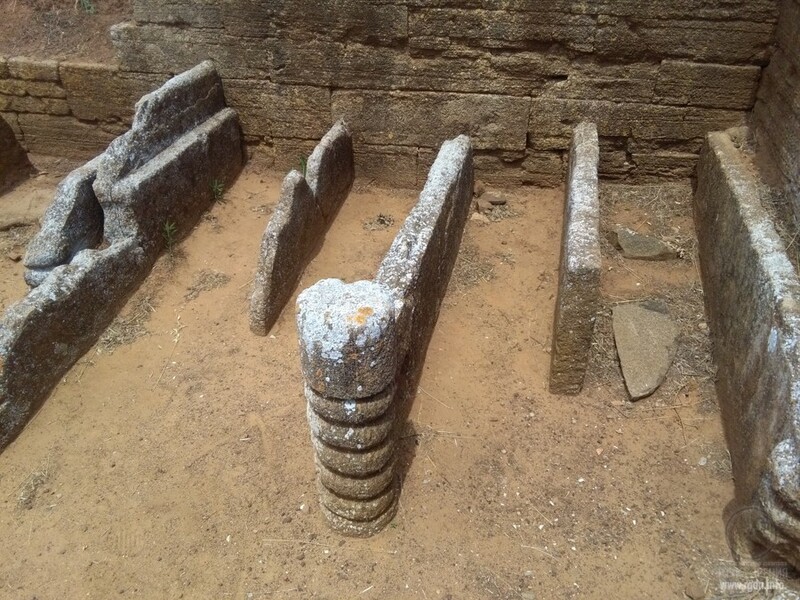 The Etruscans deeply understood the law of cycles, could read the future and grasp the signs begotten by the perpetual movement of life in the universe, where the only correct way is simultaneously horizontal and vertical. One of their sacred texts was called Ostentario – The Collection of Wonders. The Etruscans believed the miracle was life itself in all its manifestations, and it was always more than simply “life”. 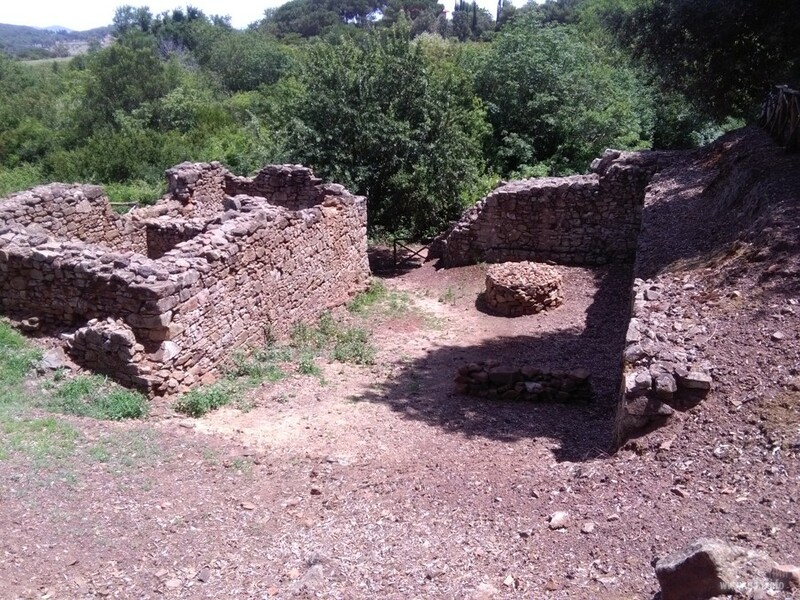 They knew the purpose of their living and built a city which was to be named Peace, but the priesthood’s thirst for power swallowed many lucumons (rulers) from among the Etruscans, and there were cases of treachery among themselves. 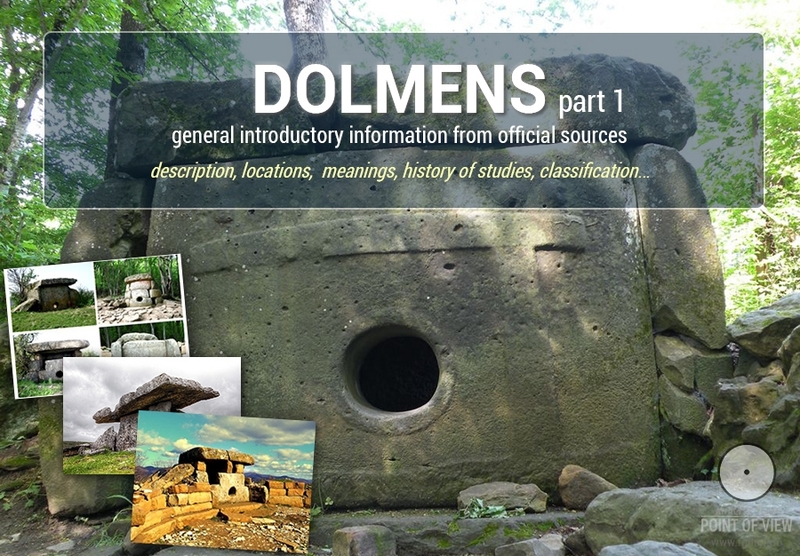 Later on the Latins were added, and then came out what came out – Rome. An attentive reader will notice that the city was named in honour of... or rather we won’t mention his name. 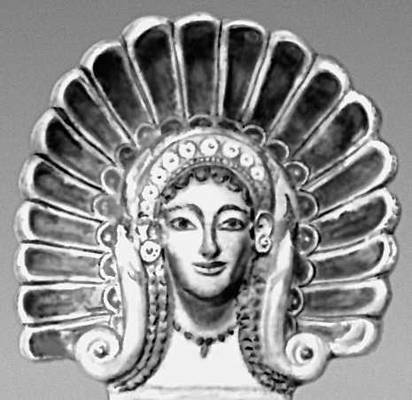 The Etruscans created unique bucchero ceramics that turned into sort of a symbol of their culture. Those were vessels with smooth or corrugated sides, with no paintings, but burnt in such a way that they seemed to be made of metal. Etruscan merchants took such ceramics with them everywhere they went. 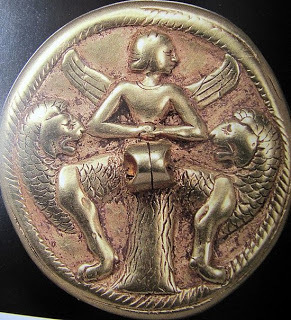 Etruscan jewellers were famous throughout the populated universe. Even Greeks could not equal with them. The elegance, filigree and complexity of their products are amazing even today. 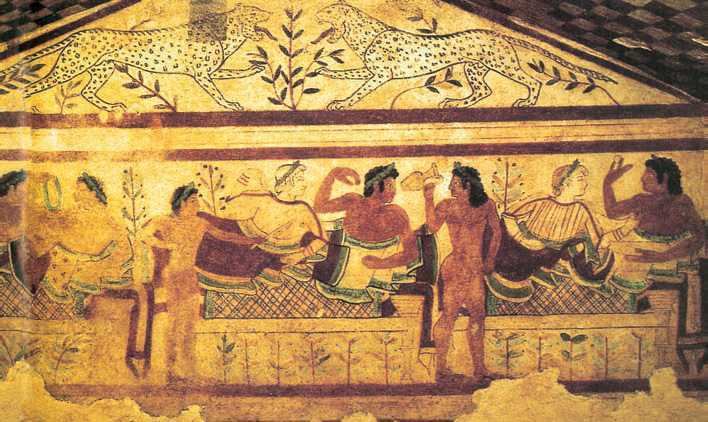 The Etruscan’s favourite technique was zern – tiny golden balls, about 0.14 mm in diameter, which were soldered on a copper plate. Nowadays there were numerous attempts to make similar small balls and find a way to join them with the base, but all of them turned out to be extremely labour-intensive. In 1836, a non-plundered tomb was discovered with numerous golden adornments inside, which staggered the entire world. Thus, the adornments included a fibula, 2.67 cm in length, decorated with five lions engraved on it and 55 embossed little ducks. At that, the whole fibula was covered with finest balls of gold, about 120,000 in number! 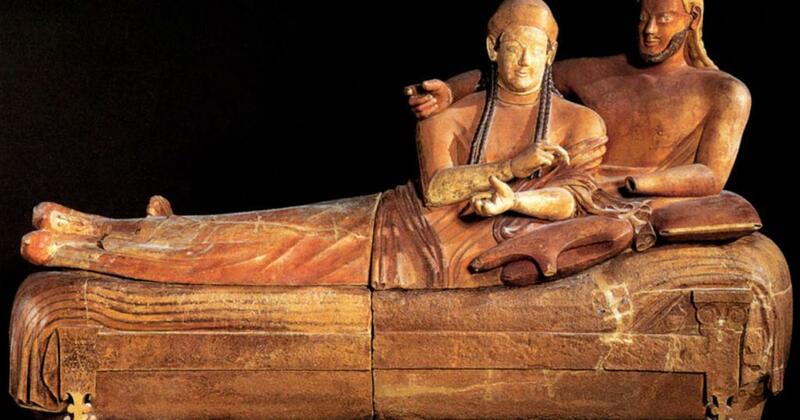 The Etruscans were excellent dentists. Their tombs contained dentures, one of which incidentally represented four golden rings that kept together four teeth. Lateral rings were installed on healthy teeth, whereas the dentures were fastened to rims of the inner teeth. Golden or terracotta crowns could also be put on damaged teeth. 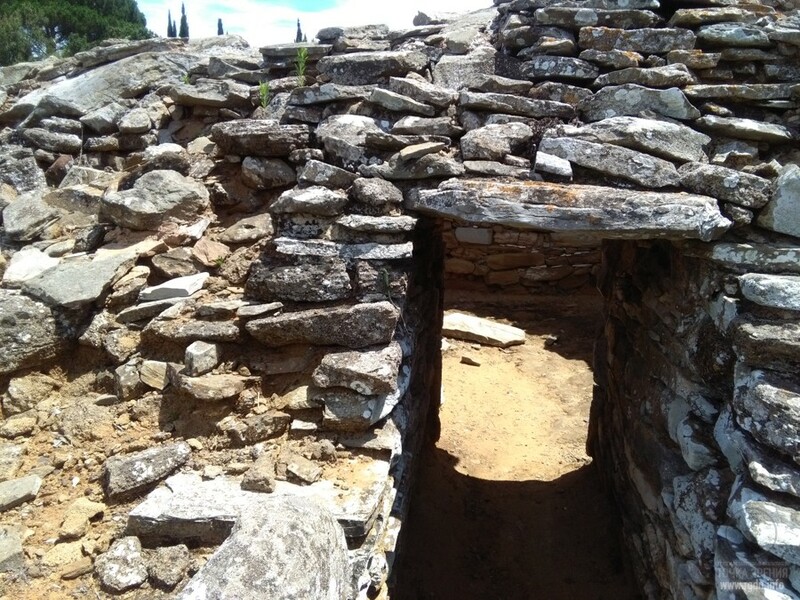 “The Etruscans were people competent in medicines,” the Roman philosopher Seneca said. A cornelian cameo with a scarab image... Several hundreds of such cameos, out of numerous found in Etruscan tombs, are now kept in the HermitageMuseum, St. Petersburg. 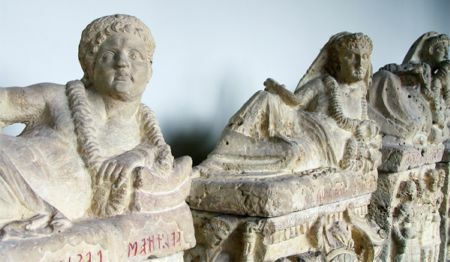 Creating unique cultural monuments and transforming the world around, the Etruscans attached greater importance to the afterlife. Isn’t this because they knew something about the afterlife, which we are not aware of today? 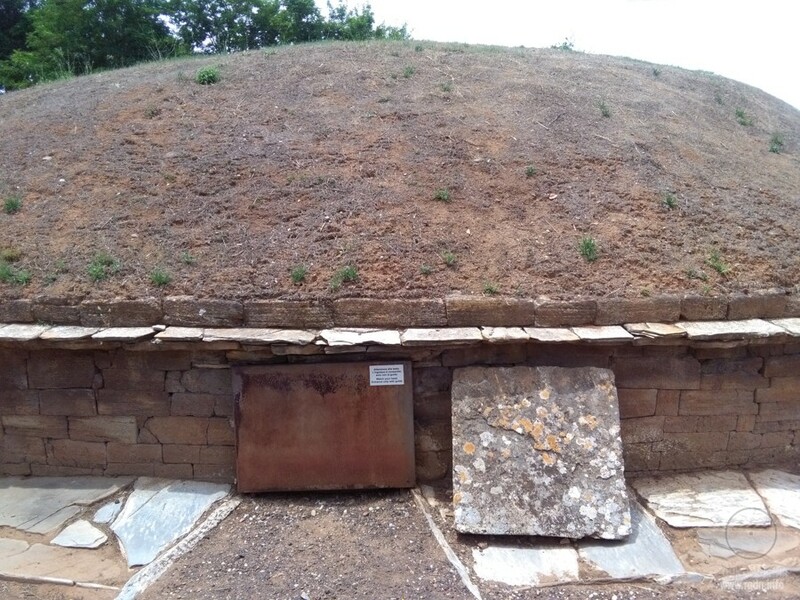 It is noteworthy that in ancient Russian heathen temples excavated by archaeologists there are evident traces of a rite similar to an Etruscan rite of sacral laying of a city. 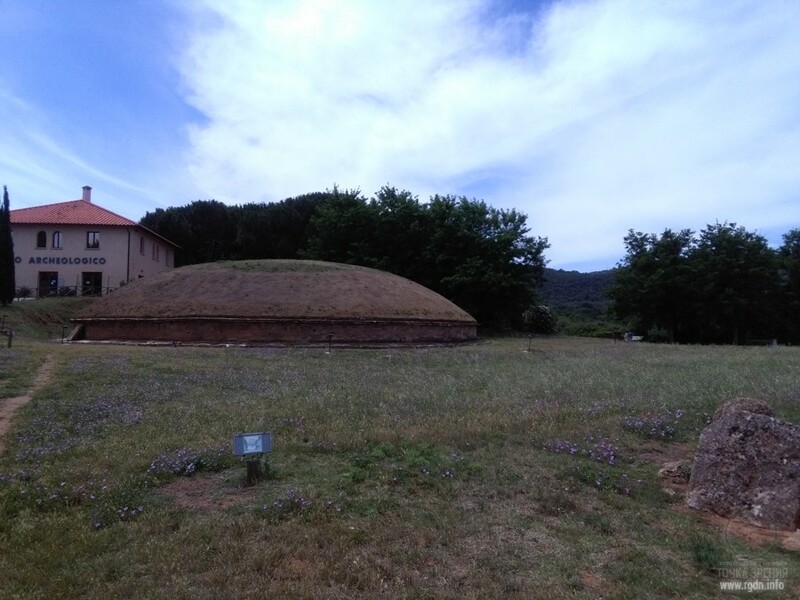 According to the rite, a big ritual fire that symbolized the centre was encircled with several small fires. 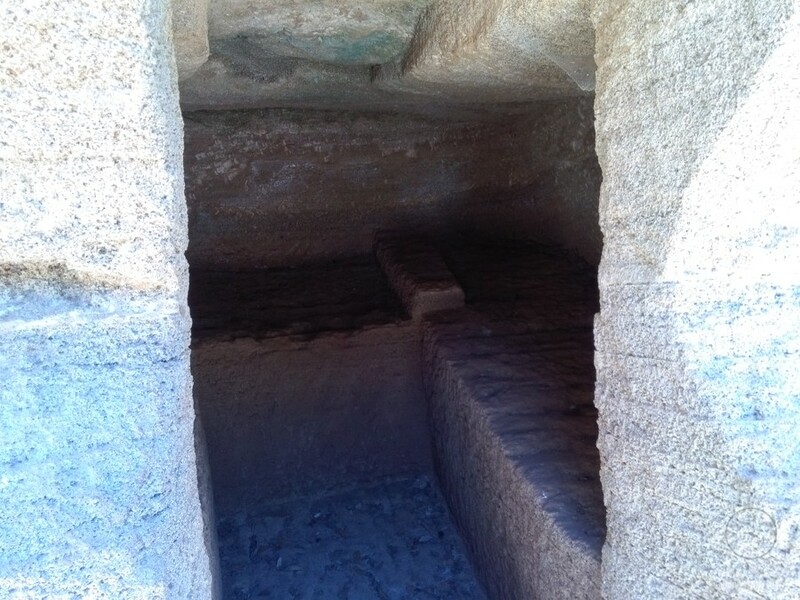 They enclosed the perimeter of the temple where a sacral action was taking place. 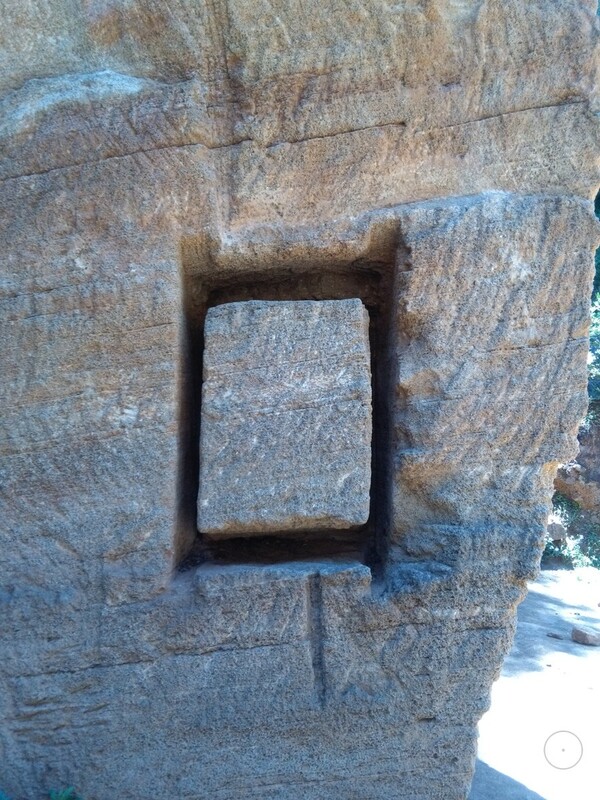 At that, the temple was strictly oriented at the cardinal directions. 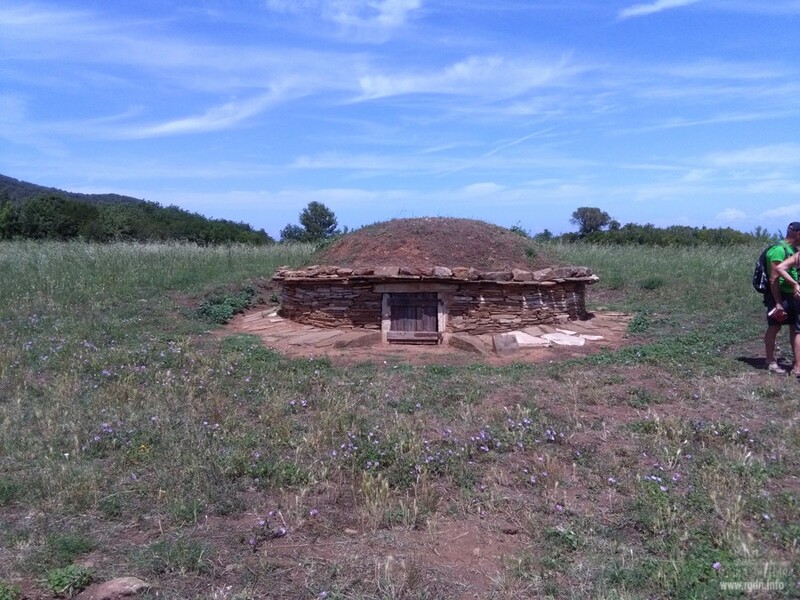 One of such heathen temples has been excavated in Peryn. 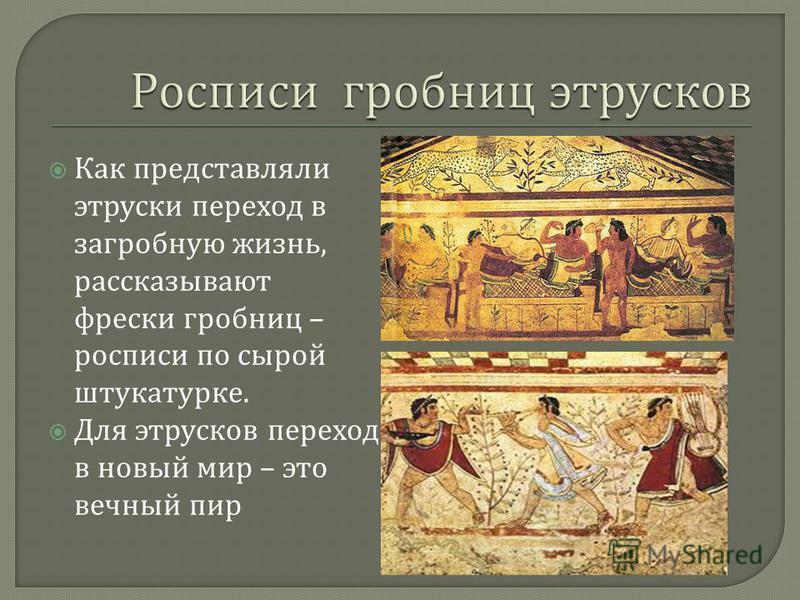 All this indicates ancient common roots in the mythological worldview of the ancient Slavs and the Etruscans. They considered themselves descendants and successors of gods. 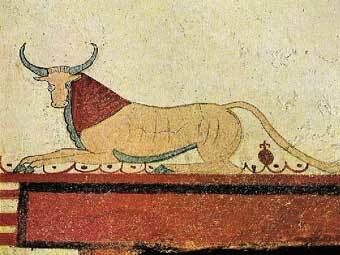 According to their legends, once upon a time god Tug presented himself to the Etruscans. 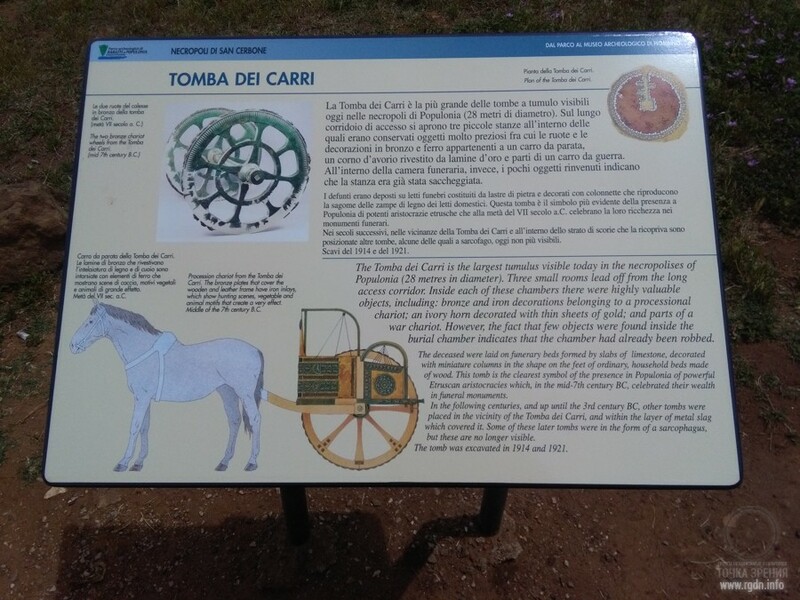 He appeared as a baby on a recently ploughed furrow right from under the ground, in order to provide the Etruscans with divine canons and teach them the art of prevision. He knew all secrets of nature and ordered the lucumons (the 12 great rulers of the people) who gathered around him, to record his stories. In a single day Tug grew old and turned grey. Having fulfilled his mission, he went back underground. His revelation was recorded word for word and later on supplemented by nymph Vegoya, and in time the code of ancient knowledge became a “bible” for inhabitants of Etruria. 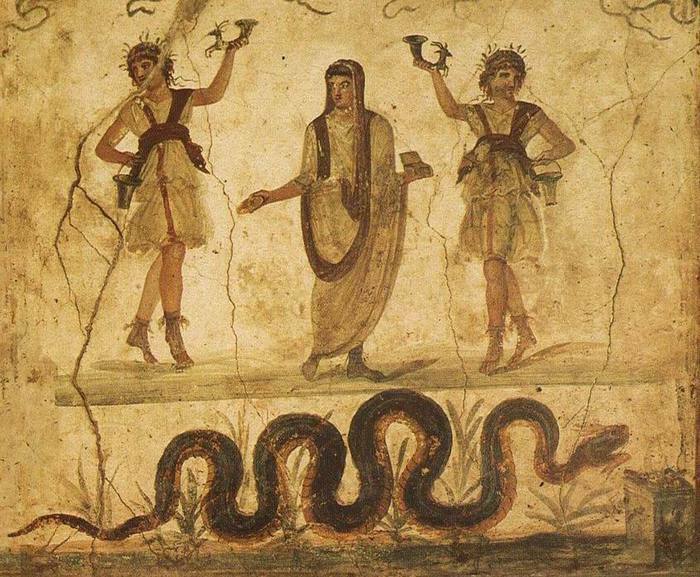 Over many centuries The Etruscan Discipline (that was the title of the aforesaid book of laws, norms and rules) determined relations between this enigmatic people and gods. 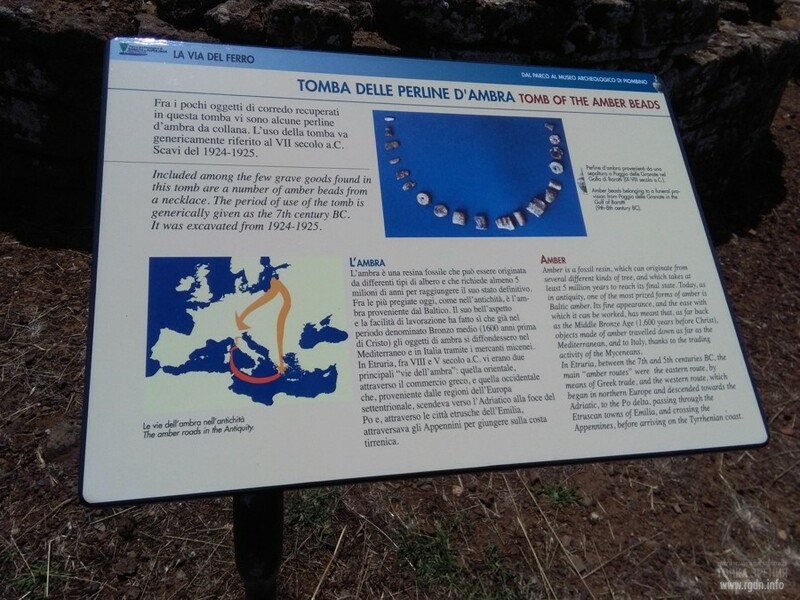 Although only its fragments have been preserved until our times, by them we can judge the Etruscan views of nature, human origin and religion – the three sides of the single life. 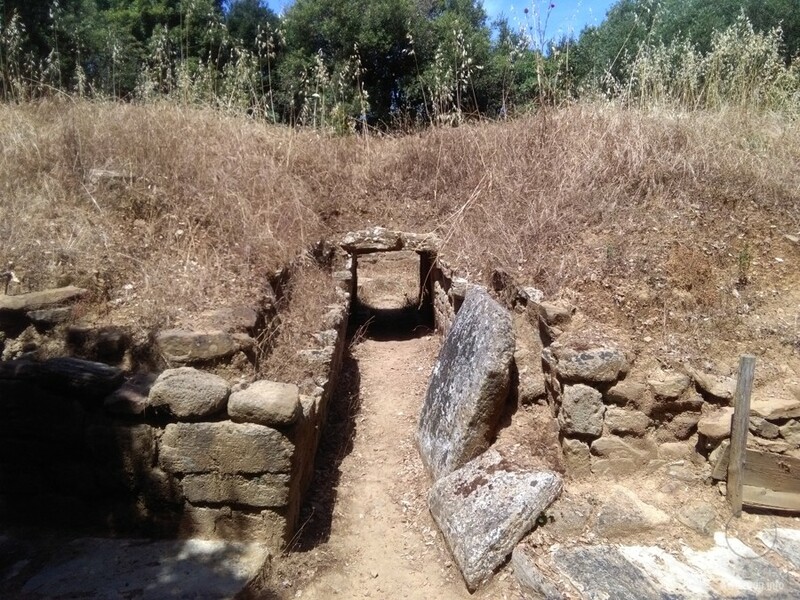 According to the Etruscans, nothing in the world happens accidentally: any event or natural phenomenon is a mere reflection of what is taking place on the invisible planes of the universe. They believed all things in existence were manifestations of a divine thought in the earthly world, which was dual by its nature. 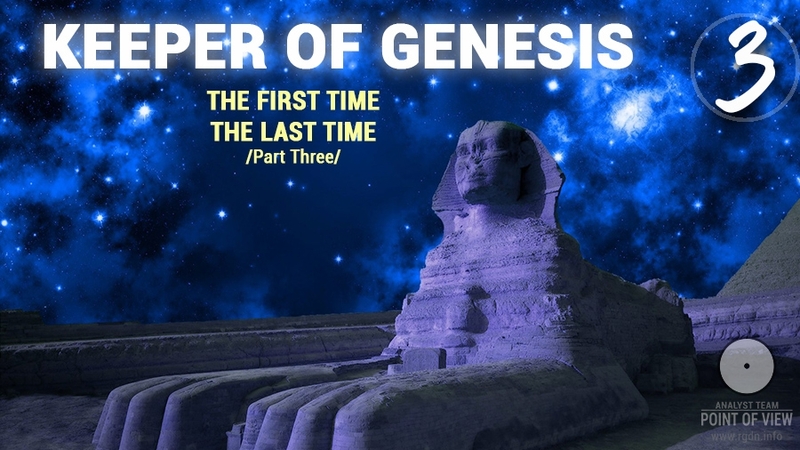 However, since all created things inexorably strive for chaos, and the Creator’s initial plan gets distorted when it is “unfolding” in space and time, it is necessary to put the created world in order again and again and to restore its connection with Heaven, with the Creator. Secrets of this divine science were known to Etruscan priests. To limit the power of chaos and to restore connections between Heaven and earth, between the microcosm and the macrocosm, they put earthly objects in harmony with celestial bodies. 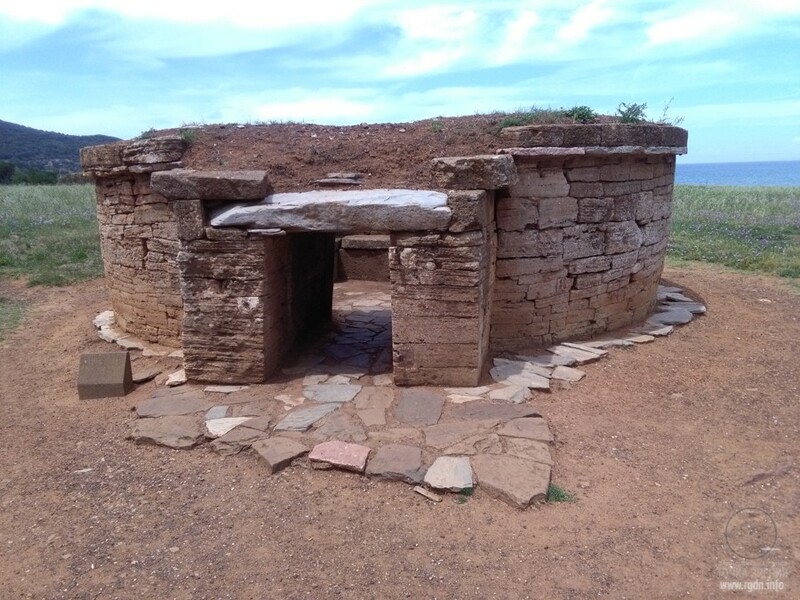 Hence, any space, whether it is a city, a hill, a valley, a piece of land or firmament, or even intestines of a sacrificial animal, turned into a sacred site, a “temple”, a “place of the Law”. 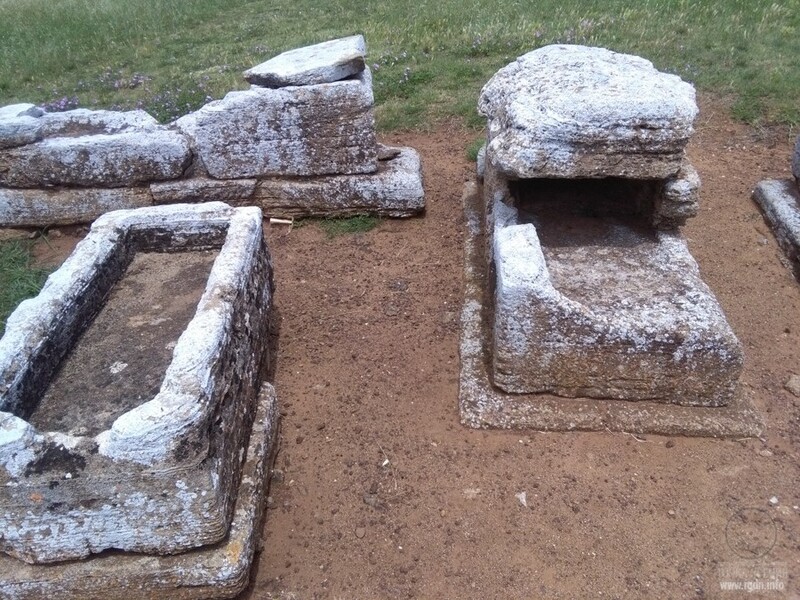 In order to observe divine signs, a priest retrieved four main points on the horizon and marked a cross on the ground with two principal axes – north-south (cardo) and east-west (decumanus). Then he divided the earthly circle into 16 sections as on a chessboard. 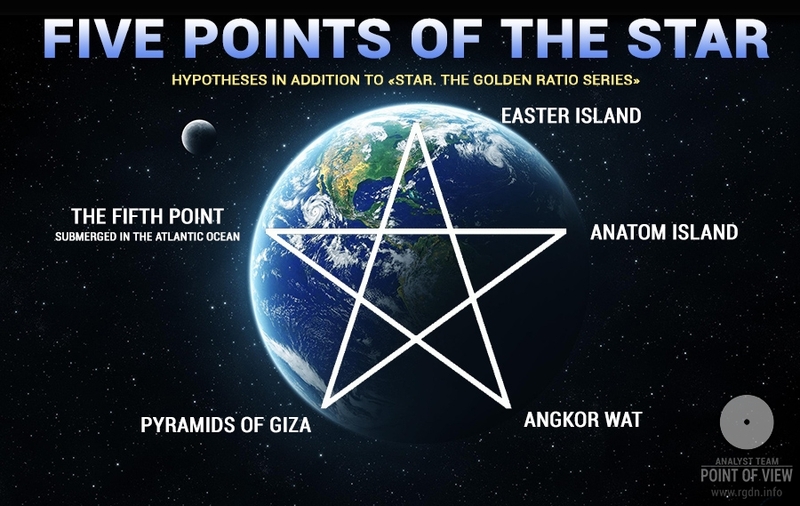 It was considered that a deity inhabited each section, and depending on in which sections of space signs occurred (where lightening got, where birds flew, etc. ), the priests determined which of the deities had sent a sign, and whether the sign was favourable or not. Human life was divided into 12 seven-year cycles – “weeks”. Every “week” brought new opportunities for a person and set new tasks for him or her; the person received gifts from gods and could address them with requests. When the tenth cycle came to its end and a person reached the age of 70, he or she lost the right to ask for and receive anything from gods. At that, at the end of the 12th “week” (at the age of 84) people “went out of their spirit”, and they did not need signs anymore. 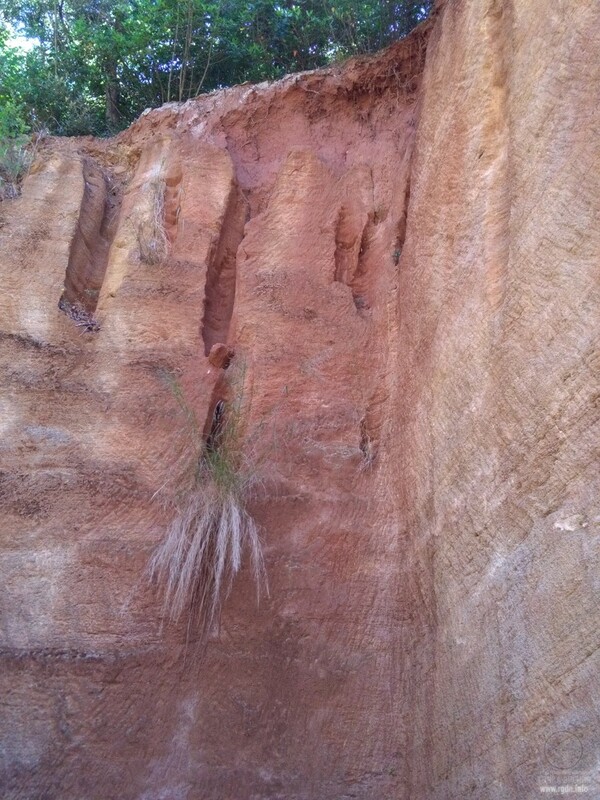 Similar longer cycles determined the life of cities, countries and entire humanity. The Etruscan faith in the flourishing and decline of everything that existed on earth was a ground for unjust accusations of the Etruscans of being pessimistic, though as a matter of fact very many ancient peoples believed that a human being and one’s destiny, just like the destiny of a people, were closely connected with cosmic rhythms, and that a single law of cycles governed everything. The law of cycles grants renovation through death, while death is basically a return to the source. 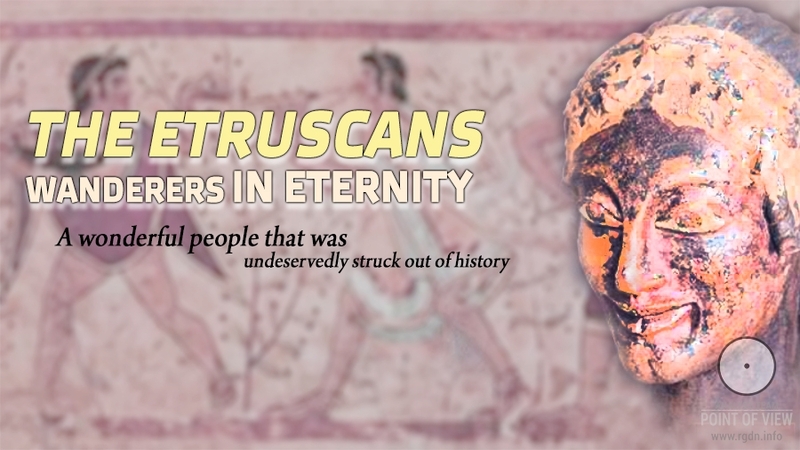 Life for the Etruscans was a short instant compared to eternity to which a human being belonged and returned. 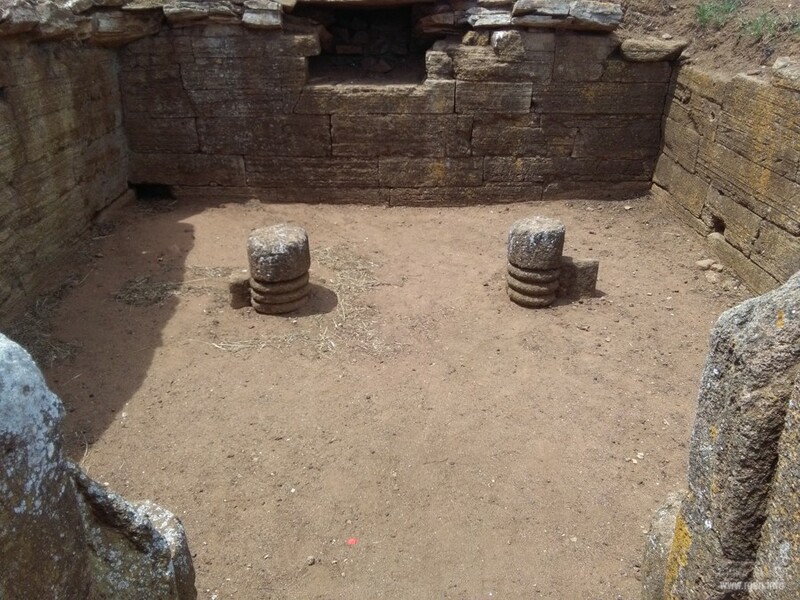 A symbolic representation of such ideas is that these people built their dwellings and even temples of rapidly decaying materials, while their tombs were made of stone blocks that survived through millennia. 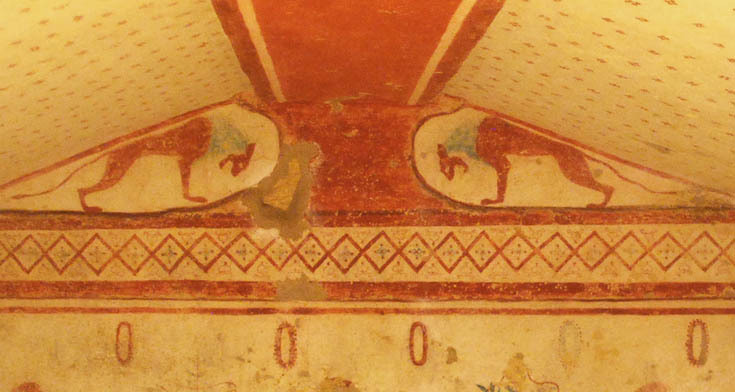 The Etruscans decorated their houses and temples with images of “frontier” animals (most frequently a horse) which connected the world of the living with the world of the dead and showed to dead people a way to the other world. In the city of Aquaross, some houses were covered with tiled images (white against a red background) of snakes (the earth element), horses (the water element) and storks (the air element). Such images were visible only from above, from “heaven”, and those who walked along a street did not notice them. Etruscan books Libri Fatale told what happened to a human being after death. Only short extracts from the books have been preserved till nowadays owing to Roman and Christian authors. 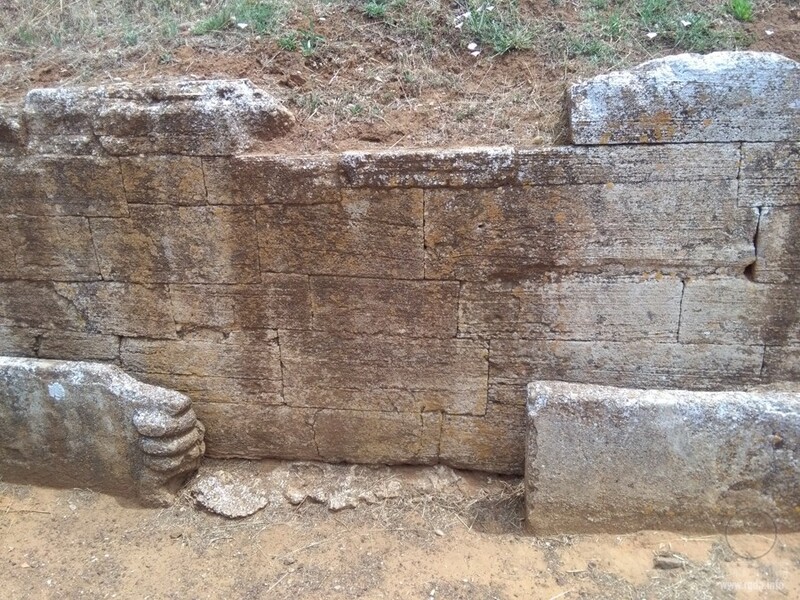 From there we know that, for instance, the Etruscans believed in the afterlife judgement passed by the winged goddess Vant, therefore they put a “book of life” into a dead person’s tomb so that the goddess would not be too severe with such person. In the book of nymph Vegoya prophecies, which tells of the essence of borders and the consequences of law violations, the following words are constantly reiterated like a spell: “Preserve the borders”. It would also be possible to refer to Etruscan merits in architecture, culture, ceramics, jewellery, metal melting, and so on, but all this is not the most important. 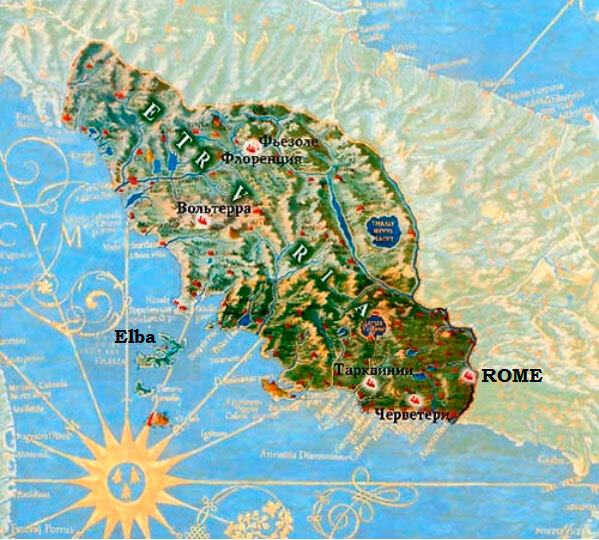 The main point is that many representatives of the Etruscan people, who truly chose to leave for Eternity, did eventually leave. The Etruscans knew they had to leave. 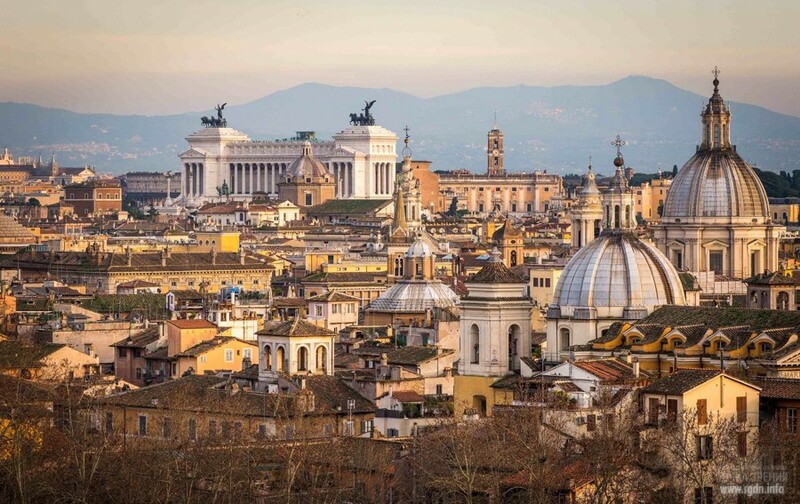 A new world – future Rome – was emerging nearby, and the lucumons came to Rome with peace when the city was only a small settlement on a hill. They drained marshes and built walls of the EternalCity, laid the CapitolineTemple, carried out reforms and introduced laws. 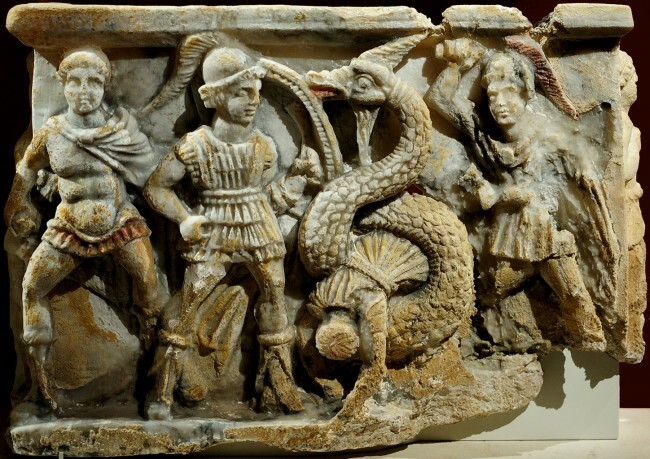 In the late 6th century BC, the Romans drove the Etruscan kings out and started waging wars against their cities. 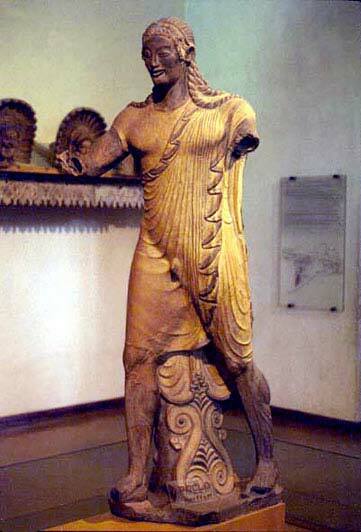 At the same time the Etruscans suffered defeats from the Greeks and Celts. At that, description of their defeats is only an outer cover of a totally different story. 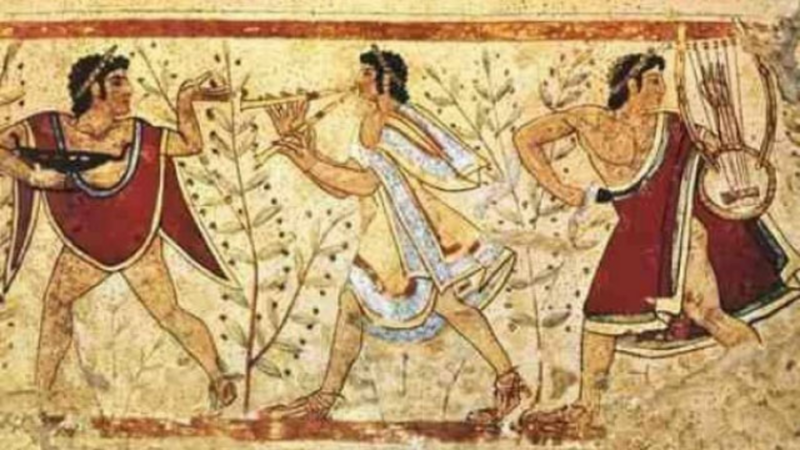 The Etruscans were preparing their departure for a long time. 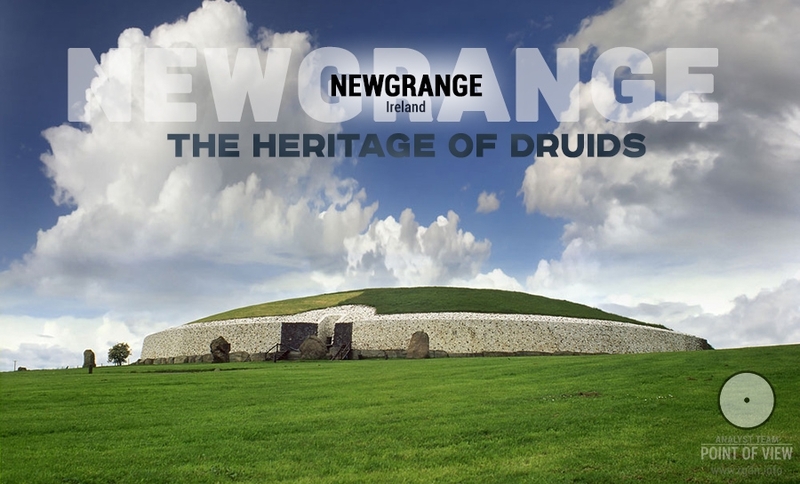 Since the 3rd century BC, many of them gradually assimilated with the new, young local people, having had the time, however, to transfer to that people everything they were to transfer: knowledge, sciences, arts and laws. Another issue is for which purpose the knowledge was eventually used by the new people. But this is s different story. 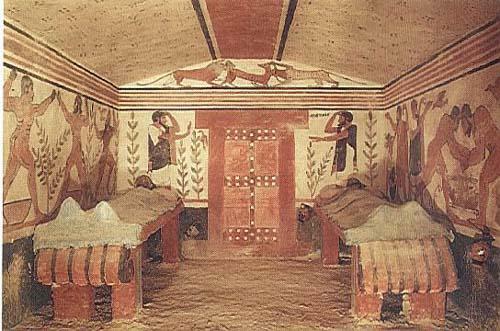 The Etruscans believed the miracle was life itself in all its manifestations, and it was always more than simply LIFE!